It had started raining heavily before we set out for Gap muffled like members of Michelin Man’s army. It was also cold, another day at 9°. We passed many a sodden cyclist en route happy, for once, to be in the warm and dry of the car. We found the Village d’Arrivee almost by chance on the road into Gap some 2km from the finish line. Happily our names were on the guest list, we were given our bracelets, our goodie bags and ushered in. I generally prefer to watch a stage as close as possible to the big screen and the finish line. With today’s weather I was more than happy to have shelter, warm food, toilets, plenty to drink and a large screen. Not forgetting a clear view of the run in. 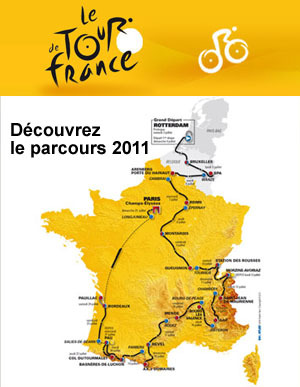 The show starts early with reminiscences from French former stage winners, a tour of the hospitality tents of the Tour’s principal sponsors chatting to their celebrity guests, a magician, a trick cyclist…………………Stop, I don’t want to appear ungrateful, just bring on the cycling. There was also a quiz and I was much amused to see that Lance had been franconified (is that a real word?) into Lens Armstrong! No need to scrap for freebies from the caravan as they deliver bags of goodies at the Village which are distributed by the hostesses. I now have a huge bag for the kids down the club. I was much amused to see cars exhorting us to visit Luxembourg. Why, they’re all here! As the day’s transmission started, the break ,which produced the stage winner, had been established only after 100km thanks to a very strong tailwind. On the 163km stage from Saint-Paul-Trois-Chateaux to Gap, the escapees included none other than Jeremy Roy and Thor Hushovd. The latter going on to re-enact the Norwegian National Championships in the run in for the line with Edvald Boassen Hagen to record his 2nd stage win of the Tour. The action was kicking off in the bunch as it approached the final bump of the day, 15km from the finish. It took Alberto three attacks but he finally shook free the Schlecks and shot off with Cadel Evans (looking very good) and Sammy Sanchez in tow. The three descended into Gap where Evans time-trialled to the finish. Thanks to the Spanish boys sticking together Cadel gained only 3 seconds on Bertie and Sammy, but more importantly he leapfrogged Frank. Returning from my Sunday morning ride, a bunch of kids, who live in the Domaine, challenged me to a bike race. I would guess that they’re aged between 12 and 14 years and they were riding a motley collection of bikes. I agreed to the challenge but pointed out that I didn’t expect to win as I was old enough to be their grandmother. I’m not above playing the age card if it suits me. They looked nonplussed. Of course, at their age, anyone over 20 is old. They said that they’d seen me riding and I wasn’t too bad [for a woman of my age], plus I had a better bike. That much was true. We established the start and finish lines and away we went. I rode the entire route sticking on their wheels. Their tactics were obviously copied from the Schlecks: no attempt to use their superior numbers to burn me off. It was everyone woman and teenager for themselves. As we crested the final climb, it dips down ever so slightly to the finish line. As anticipated, they eased off on the crest. I didn’t and shot across the line, much to their astonishment, to record my first scratch race win. I could see that I’d caught them totally off guard. I explained that racing was all about doing just enough to win, and no more. Races are won with the heart, legs, lungs and head. Just let me know when you want a rematch, I said as I left them gazing in what I think, and hope, was admiration. I’ve ridden over 500km this week. It was paying dividends. The first nine days of this year’s Tour de France has also thrown up some surprises, not all of them as pleasurable as my win. Sadly, for variety of factors, a number of riders, including those whom we might have expected to figure on GC, are out of the Tour. It’s always distressing to see riders crash and we’ve been left wondering what riders such as Bradley Wiggins, Alexandre Vinokourov, Janez Brajkovic and Jurgen Van Den Broeck might have achieved this year at the Tour. I think it’s fair to say no one expected Thor Hushovd (Garmin-Cervelo) to keep such a firm hold on the yellow jersey for so many days, clearly relinquishing it only today on the verge of exhaustion, looking forward to tomorrow’s “rest day”. That term’s such a misnomer given the riders will ride for several hours and spend time talking to the press and their sponsors. Thor’s surely graced the jersey and his team which, with wins in the team time-trial and Stage 3 (Tyler Farrar), can already regard this year’s Tour as a success. Norway can also claim to have had a successful Tour if one takes account of Edvald Boassen Hagen’s (Sky) win on Stage 6. Philippe Gilbert (Omega Pharma-Lotto) predictably won the first stage and has been ever-present, wearing all three jerseys (yellow, spotted and green) and is now making a serious run at holding onto the green jersey until Paris. Cavendish (HTC) has opened his account with two stage wins and I’m sure will give PhilGil a run for his money in the competition for the green jersey. The changes made this year to the competition for this jersey have certainly made it more competitive and much more interesting. Initially, the commissars seemed to be a little too job’s worthy over the comportment of certain riders in the intermediate sprints, but this seems to have satisfactorily settled down. The French, particularly FDJ, have been animating each day’s breakaways in search of tv exposure for their sponsors and perhaps, perhaps, a stage win. Surprisingly, escapees won both stages this week end. Yesterday was the turn of Rui Costa (Movistar) notable for his handbags at dawn clash last year with Manuel Garate and today it was Luis Leon Sanchez (Rabobank). But the BIG news, joy of joys for the French, it was the turn of perennial favourite Thomas Voeckler (Europcar) and a rider who’s been very visible this week, to wear the precious maillot jaune. Thomas took yellow, after the peloton, perturbed by the earlier crashes, finally gave up the ghost and stopped chasing. Thomas can now look forward to a number of days in yellow. 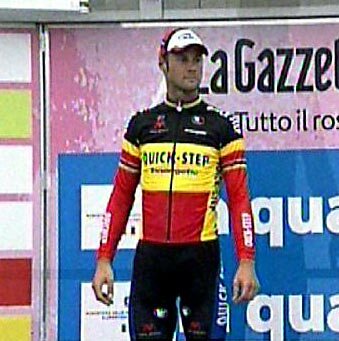 He was positively bouncing on the podium and, from the size of the jersey, it was clear that the ASO had been anticipating another day in yellow for Thor. Two of Thomas’s breakaway companions were taken out of contention for today’s win by a crazy manoeuvre from a France Television car which sent Juan Antonio Flecha (Sky) flying and Johnny Hoogerland (Vacansoleil) into some barbed wire fencing. Amazingly, they both remounted and went on to finish the stage. 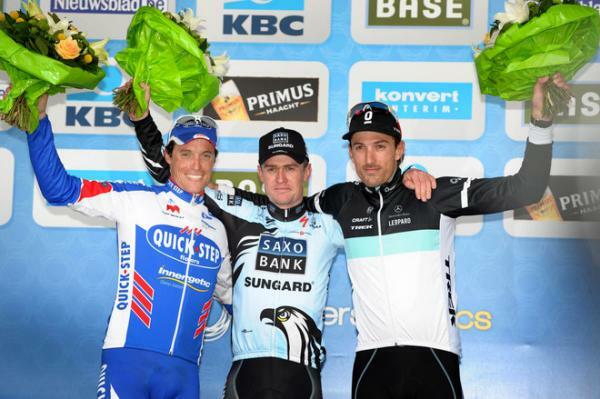 Hoogerland had regained the spotted jersey while both were awarded the day’s combativity prize. Hardman Hoogerland who seemed to have cornered the market in white bandages was reduced to tears on the podium. A number of teams and riders have been totally anonymous. For example, the all Russian Katusha squad have barely merited a mention apart from today’s retirement of Russian champion Pavel Brut. On a more sinister note, there was much speculation and alleged video evidence that Contador’s fall today had been provoked by Karpets (surely not) shoving him off the bike. Ivan Basso’s team have been similarly missing in action but one could argue they’ve just been doing their job keeping Ivan in a good position. The remaining GC favourites have yet to really show their hands. While every move they make is endlessly analysed, we still know very little about their respective forms. While Cadel Evans has wasted no opportunity to build up a lead on the others, most notably Alberto Contador, it’s still all to play for the in the coming days in the mountains. The fabulous weather is continuing and this morning I rode with my coach. I always look forward to our rides together. Not only do we have an enjoyable discussion as we’re rolling along but I always have a few take-aways to help improve my riding skills. This morning I was keen to pick his brain as to how we might find additional funds for the club. As ever, he had a number of useful contacts and some good advice. It took me an hour to ride to our rdv point and thereafter we continued along the Var valley, into the usual headwind, before turning off down the Vesubie valley. We were riding the route of the last club championship. Sadly, it’s not been held for the past two years so I’m still the reigning ladies club champion. It’s a route I enjoy, with some climbing, but none of it too steep: ideal terrain for a spot of interval training. On the way back, I was waived down by a rider in distress. His pump had failed to inflate his inner tube after a puncture: Wonderwoman and her pump to the rescue. He was decked out in Astana kit version 2009 with a Trek bike. I could tell that French wasn’t his native tongue. I suspect he might well have been Eastern European. Wheel inflated we rode off together. I intended to ride with him just in case he had further problems. However, while we had established that we lived not far from one another, we failed to check we intended going the same way. I turned off the main road to return by way of the cycling path along the Var while he continued on the main road. I hope he got safely back home. By the time I arrived home I had spent just 1 minute less in the saddle than the winner of today’s Tour stage into Lisieux although, in all fairness, I had ridden a rather shorter albeit much lumpier stage. My timing was impeccable. I was soon washed and changed ready for my afternoon’s viewing. Sadly, the peloton had another wet and windy day where caution was the watchword on the slippy roads. Euskaltel’s Ivan Velasco was another non-starter this morning as yesterday’s tumble into the barriers had resulted in him breaking his collarbone. At the start, there was plenty of white tape in evidence on the limbs of those who fell yesterday. It’s much easier in the earlier stages of the Tour to target one of the jerseys. This morning Cadel Evans was wearing the spotted jersey but, with more points on offer today, the “Group of 5” set off with purpose, one of whom attained his goal. This evening the spotted jersey is on the shoulders of Johnny “Hardman” Hoogerland who eschewed a rain jacket today in his quest for the spots. The GC favourites, keen to keep out of trouble, spent the day massed at the front, sheltering behind their team mates. The last of the Group of 5 was taken back just before the final climb. 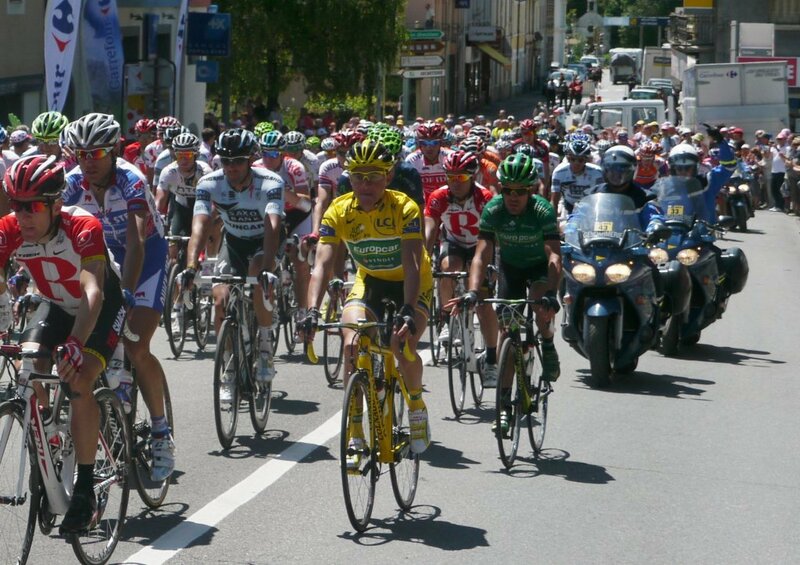 Both Thomas Voeckler and Alex Vinokourov attacked but it was to be another day for the sprinters. Led out by Sky team mate Geraint Thomas, after a powerful well-timed sprint, Edvald Boassen Hagen took his maiden Tour win in front of his parents. HTC’s Matt Goss was second, sandwiched between two Norwegians. That’s right, Thor was 3rd, retaining the yellow jersey. None of the other jerseys changed hands. The only “loser” today was Levi Leipheimer who crashed before the final climb and lost over a minute. We’ve now passed from Hinault into Anquetil country. Tomorrow’s flat stage will be another one for the sprinters. My beloved left for yesterday’s pointage in the early morning fog. I rolled over for another hour’s sleep. Eschewing the ride up Ste Agnes to see one of my favourite one day races, the Tour of Flanders, where Belgian television coverage was starting at midday. I settled for a run along the sea front, followed by a quick coffee and collected the Sunday newspapers. Back home I prepared lunch before settling in for a marathon viewing session. 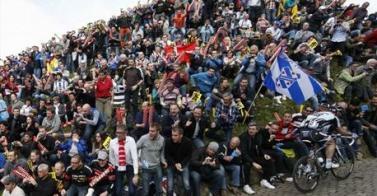 No where and no one is more passionate about cycling than Belgium and the Belgians. And this is their race, their day in the sun. They line every kilometer of the course, standing over 10 deep on the bergs, quaffing beer and consuming their beloved frites with mayo. The sun was indeed shining, it wasn’t overly windy, near perfect riding conditions. The parcours starts in the beautiful city of Bruges and zigzags 258km to Meerbeke over 18 steep, sharp climbs and 26 sections of cobbles. The climbs come thick and fast after 70km of flat. If one can refer to cobbles as flat. The cobbles are smaller and more regular than those in Paris-Roubaix but, as the riders traverse them, their upper arms judder as if they’re undergoing some form of electric shock therapy. The race is largely held on dirty, narrow farm roads which wind through the villages en route. To be in contention you need to remain vigilant and towards the front of the peloton. The slightly-built Spaniards from Euskaltel-Euskadi and Moviestar who would, no doubt, prefer to be riding in the Basque country, but they got the short straw, cling to the back of the peloton, grateful for assistance on the climbs from the beefier Belgian spectators, wondering when they’ll be able to climb off their bikes. One innovation this year was cameras in four of the team cars (Quickstep, Omega Pharma-Lotto, Garmin Cervelo and SaxoBank Sungard). From time to time, you could hear the instructions being barked to the riders, although you might not have understood what was being said in every instance, unless you understood Flemish. Given the opportunity, I could happily watch every minute of this race from start to finish. As television coverage commenced, there was a group of 5 riders out in front who were being gradually hauled back in. The second group of 18 riders on the road contained a lot of team leaders’ wingmen sparing their teams the effort of chasing them down. Although the pace was pretty frenetic with teams trying to keep their protected riders at the front of the pack, and out of harm’s way. The main peloton splintered with a number of riders losing contact and there were plenty of spills but, thankfully, none looked to be serious. The group of 18 was hauled back in and the chasing pack now consisted entirely of favourites with their key riders. With 86km to go Sylvain Chavanel (Quickstep) takes off on the Ould Kwaremont, hotly pursued by Simon Clarke of Astana. With 79km remaining they bridge up to the lead group, initially giving it fresh impetus, but ultimately leaving it behind. Meanwhile, behind them on the Taaienberg, Boonen (Quickstep), Flecha (Sky) and Van Avermaert (BMC) are forcing the pace. Others, such as Edvald Boassen Hagen (Sky) and Lars Boom (Rabobank) have pinged off the front, followed by Van Avermaert, Guesdon (FDJ), Hayman (Sky) and Leezer (Rabobank). Among the favourites, everyone seems to be waiting for Cancellara to make his move. Up front on the Molenberg, Chavanel is now on his lonesome at the head of affairs with 44km to the finish, the gap back to the peloton is 55 seconds. Finally, unable to wait any longer Thor Hushovd (Garmin Cervelo), resplendent in his rainbow jersey, heads to the front of the bunch quickly followed and then overtaken by Tom Boonen (Quickstep) and his shadow aka Filippo Pozzato (Katusha) and Fabian Cancellara (Leopard Trek). Fabian goes into TT mode and rides away, the others start looking at one another waiting to see who’ll chase. Too late, he’s gone and swiftly heading for Chavanel. Wilfred Peeters tells Chavanel to stick on Fabian’s wheel as he goes past and to do no work. He does as he’s told. The bunch don’t seem to be making much of an inroad into the gap back to Chavanel and Cancellara, they need to get themselves organised. Back to the team cars, Peeters is telling Leopard Trek’s DS that Chavanel is unfortunately too tired to contribute. Over at Garmin Cervelo, Jonathan Vaughters is telling his troops to do no work at all, just sit in and sprint for 3rd. Finally, the bunch gets themselves organised and they catch Chavanel and Cancellara on the iconic Muur, just 15km to the finish and the favourites are all back together again. Phil Gil (Omega Pharma-Lotto) makes his trade mark attack on the last climb, the Bosberg, but is soon caught by Cancellara, Ballan (BMC), Leukemans (Vacansoleil), Chavanel and Schierlinckx (Veranda Willems). Flecha (Sky), Nuyens (Saxobank Sungard), Hincapie (BMC), Boonen, Langeveld (Rabobank) and Thomas (Sky) join them. Ballan puts in a dig, Phil Gil follows. The attacks are coming thick and fast as riders chase one another down. With 4km left, Langeveld attacks, a 3-man group of Cancellara, Chavanel and Nuyens follows and stays clear to contest the sprint finish which is won by the fresher man. The Belgians have a Belgian winner, Nick Nuyens, who rode a very intelligent race. Cancellara didn’t get back-to-back victories, but Bjarne Riis did. Vuelta Ciclista al Pays Vasco Postscript: There is something enormously satisfying in watching the professional peloton suffer on roads on which you too have suffered. The finishing line for today’s 151.2km stage around Zumarraga was just 3km from the top of the rather brutal Alto de la Antigua. Some of those boys got off and walked up. I knew just how they felt. Purito held off Sammy’s (too?) late charge for the line to take the leader’s jersey. I was only in London for a few days but, away from all that is dear and familiar, I felt really out of the loop on my return. Races had finished without me knowing who had won and, even worse, races had started and finished without me knowing the victor. Of course, I could have checked on the internet but I was trapped in the wedding bubble and couldn’t break free of the programme. There’s little if nothing in the UK newspapers on cycling, although, as the wedding coincided with the World Cup races in Manchester, there was some mention of Britain’s track superstars. I’ve been so busy catching up that I’ve had little time to reflect on the past few days of racing. However, one thing is clear, the promising young guns of the past few years are starting to emerge more strongly. Witness Gesinks’s (Rabobank) win in the Tour of Oman, a hilly parcours than last year, intended as a counterpoint to the earlier sprinters’ fest in Qatar. Joining him on the podium were Edvald Boassen Hagen (Sky) and Giovanni Visconti (Farnese Vini – Neri Sottoli). Over the weekend the Tour Cycliste International du Haut Var, with a title almost as long as the race itself, was won by perennial French housewives favourite Thomas Voeckler (Europcar), second was Julien Antomarchi of VC-La Pomme Marseille and, another former yellow jersey wearer, Rinaldo Nocentini (AG2R) was third. Further south in the Volta ao Algave, Tony Martin (HTC-Highroad) took the final day’s time-trial and the GC ahead of Tejay Van Garderen (HTC) and Lieuwe Westra (Vacansoleil). The defending champion Alberto Contador (SaxoBank Sungard), in his first race back since his suspension, faded into fourth place on the final day. This week it’s the Vuelta a Andalucia Ruta Ciclista del Sol which kicked off with a 6.8km prologue around Benahavis won by Jimmy Engoulvent of Saur-Sojasun. Jonathon Hivert (Saur) won Stage 2’s 161.8km print into Adra while Francisco Ventoso (Movistar) won Stage 3’s sprint into Jaen. Markel Irizar (RadioShack) leads on GC from Jurgen Van Den Broeck (Omega Pharam-Lotto) and Levi Leipheimer (RadioShack). Over in Italy at the Trofeo Laigueglia, Daniele Pietropoli (Lampre-ISD) beat off Simone Ponzi (Liquigas-Cannondale) and Angel Vicioso (Androni Giocattoli) in a sprint for the line. The Giro di Sardegna got underway this week and in yesterday’s 138km first stage from Olbia to Porto Cervo, Peter Sagan proved too strong on the uphill finish for Allessandro Ballan (BMC) and his Liquigas teammate, Daniel Oss. Sadly, very little of this afore-mentioned action has been televised. I haven’t even glanced at what’s been happening in the Tour of South Africa and Vuelta Independencia Nacional. A girl’s got to draw a line in the sand somewhere. Meanwhile, I will be looking forward to this week end’s Belgian semi-classics: Saturday’s Omloop Het Nieuwsblad and Sunday’s Kuurne-Brussels-Kuurne. Today my beloved had a business meeting in Geelong (fortuitous or what!) which gave me an opportunity to check out the course. The ride from Melbourne to Geelong was open and very windy although the forecast for later in the week is for less wind. The circuit around Geelong is on wide, well-maintained roads and the drag up to the finish could well mitigate against a true sprinter, like Cavendish. The two climbs are short and steep but riders like Gilbert and Cancellara will just power up them. Short steep ascents also mean fast ascents which could play into the hands of someone like Fabulous Fabian, enabling him to solo away. On the circuit, the wind may play a part either as a strong head or tailwind. The latter will make it difficult for someone to take a flyer, the latter will assist. So who are the favourites in the Men’s road race? You cannot discount anyone from those teams fielding 9 riders. I think Bettini, wily fox that he is, has done his planning and preparation well and chosen a strong squad to support Pozzato who’s obviously in form after the Vuelta and his win in Sunday’s Sun Herald Classic in Ballarat. I had a chance meeting with the Spanish squad today, who are throwing their weight behind Oscarito, and he certainly fancies that uphill 150m drag to the finish. The boys were wrapped up against the biting cold wind and delayed the start of their practice ride until the squally rain showers had passed. The boys were obviously concerned about the weather and spent sometime checking out the weather forecast for the coming days. Luckily for them (and me) the mercury is set to rise at the week end. I would categorize it as an Ardennes Classic type of course, although the climbing is concentrated in the latter 2/3rds of the race, so should suit my tip for the top, Gilbert, as well as others who have fared well in these types of races, such as Frank Schleck. That’s why I think it’s a shame that my favourite Kazakh has passed on this race. It would have suited his attacking style and one can always rely on him to enliven any race he enters. One cannot discount Kolobnev who has performed well in the past (Stuttgart and Mendrisio). Nor can one ignore the home team, the Aussies, who will be keen to not only defend the rainbow jersey but also win on their turf. They should know the course better than anyone. So am I saying it’s all to play for? No, even assuming that the weather is not a major factor, the stronger, larger teams will seek to put the pure sprinters under pressure and whittle down the peloton to ensure they are not duking it out in the final stretch. It’ll be a fast race and my pick is as follows: Gilbert (1), Pozzatto (2), Oscarito (3). It’s hard to look beyond Cancellara and Tony Martin for the time trial. This tends to be a much more predictable race. I favour Fabulous Fabian over Tony and I’m going for Lars Boom to place 3rd rather than Edvald Boassen Hagen or Ritchie Porte. Both women’s races look to be very open with no clear favourites. Though again, I expect riders from the larger teams to hold sway likewise, in the U23 races. In these races I shall be cheering for the French and, in particular, Jeanni Longo who’s old enough to have a grandson riding in the U23 race. That woman is my inspiration. We arrived in San Remo before 11:ooam, parked the car, bought La Gazzetta dello Sport and went for a coffee to read who the pundits in Gazzetto and L’Equipe favoured for a win. La Gazzette favoured Boonen while L’Equipe hedged their bets with Boonen, Gilbert and Boassen Hagen. After Boonen, La Gazzetta plumped for Boassen Hagen, Bennati, Pozzato, Cancellara, Paolini, Gilbert and two-time former winner, Freire. Cavendish, it was felt, was pretty much out of the running following his lack lustre performance in Tirreno Adriatico. We scouted out a good location, opposite the TV screen and podium, just past the finish line and took up our positions at around 01:00pm, two hours before the television coverage started. Watching cycling is not for the faint-hearted or for those who lack patience. To be fair we were entertained with some sporting action albeit cross-country skiing. The time passed quickly and the crowds got thicker. Only the early birds get the front rows. Super Mario arrived: queue frisson of excitement amongst the crowd. As the transmission went on air it was evident that the boys had been enjoying some inclement weather en route. However, it was dry in San Remo and, while the sky looked menacing, rain was not anticipated. In any event, we’d both dressed warmly and comfortably: we’re old hands at this. The favourites all looked to be well placed and well protected by their team mates. I always think that you need patience to win Milan-San Remo, you have to wait for the right moment. Go too soon, like Pippo and Philippe, and your bolt is shot. Riders started to become distanced on the Cipressa and Poggio but again the favourites were still in touch coming down into San Remo and the final kilometres. Bennati was being led out with Freire on his wheel followed by Boonen. Freire shot out from behind Bennati like a rocket and there was no catching him. Third-time lucky for Freire (previous wins in 2004 and 2007) who recorded his 4th win of the season. 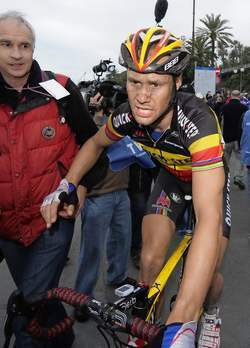 Boonen hung on for 2nd (his best finish to date) while Petacchi was 3rd, which cheered the largely Italian spectators. We couldn’t resist one more delicious coffee before heading home, job done.